Promotions include team photo giveaway and annual D.A.R.E. day at 11 a.m.
DANVILLE, Va. - The Danville Braves will finish its 2018 regular season home schedule with three games against the Bluefield Blue Jays on August 21-23. Danville will begin its homestand on Tuesday, August 21 at 7 p.m. on $2 Tuesday and with a team photo giveaway. The first 500 fans will receive the 2018 Danville Braves team photo, sponsored by HomeTrust Bank, as well as access to $2 general admission tickets, hot dogs, corn dogs, French fries and tall boys. At 11 a.m. on Wednesday, August 22, the D-Braves will host its annual D.A.R.E. day at the ballpark in addition to Kids Free Wednesday. The Braves will partner with Inframark and the Drug Abuse Resistance Education program to educate local schools with an on-field demonstration before the game. The D-Braves will close out its regular season schedule with a Thirsty Thursday on August 22. In partnership with Buffalo Wild Wings, the Danville Braves will offer discounted fountain and draft beverages. 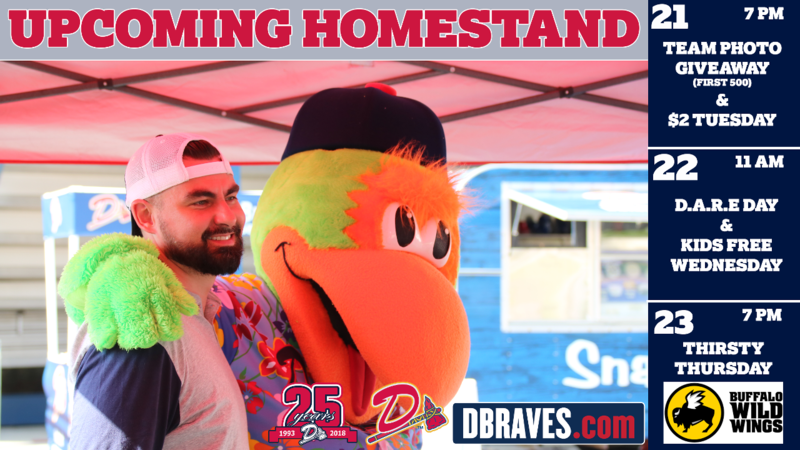 Spots still remain for the D-Braves all-you-can-eat seats ticket packages. Fans can receive all-you-can-eat access to hot dogs, popcorn, souvenir cups, fries, and burgers for $25. The ticket comes with a blue reserved seat ticket, and the offer is valid through the seventh inning of each game. For the Braves full flight of promotions, fans can visit www.dbraves.com.